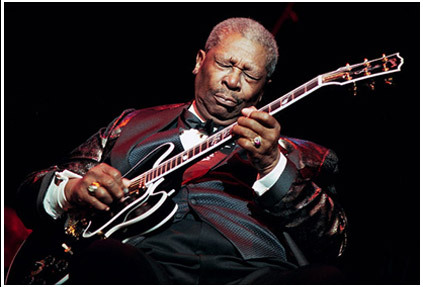 Referring to BB King's Lucille: which one? There are several guitars that have gone under that name: for example, ES 335's, and the current ES 355. "I've had many guitars...and I always call them Lucille". Either or. His Lucille guitars are all pretty famous are they not? I have to agree, without even thinking about it that's the first thing that poped into my mind. He's famous for playing certain Gibson models, but as the subject of this topic is the Greatest Single Guitar Of All Time, I don't think a myriad of Lucilles qualify. Others may think differently. Clearly different people have different ideas about what "single" means. I don't count "Lucille" as one guitar - BB's had lots - but Alvin Lee's 335 was a single instrument. Hendrix played mostly Strats - but they were virtually interchangeable to him. Not a "single instrument" to me. SRVs #1, on the other hand is a single strat. As is Dave Gilmour's black strat, or Rory Galagher's mutt. But to the general public, Lucille is just one guitar. But whatever. I'd kill just to have any of the instruments mentioned. These ones are surely very famous, and very nice guitars! And a nice sound too! That's another very classical guitar! anything and everything so it seems !!! I agree with huw. In order to be considered "single" most famous guitar, that guitar has to be somewhat unique (Eddie's Frankenstrat) and have survived throughout the history of the guitarist. A perfect example of the latter is Brian May's guitar. So while many great guitarists have played Strats, in general they didn't play the same one throughout their career. Same with Angus and the SG's. He has a lot of them. Same with BB King and Lucille. had for most of his career. And although he has more than 1, they all look the same. So, in summary, the uniqueness, overall market penetration, and consistency make that the single most famous guitar. I have to respectfully disagree, at least among guitarists. These are all legendary guitars. Which is the most known depends on who you talk to. Head to the southeast and Duane Allman's Les Paul is king among many. That said, I think you'll have to ask Gibson's Custom Shop how many Lucilles (or Lucy's) they've sold against Page's Number One. If you ask a metal bassist, he might say Steve Harris' blue P-Bass. Or a jazz bassist might go for Jaco's Jazz Bass. It depends on your generation and your influences. Personally, I'd be hard pressed to decide between Trigger and Page's Number One LP. But let's face it, no single instrument has defined hard rock imagery more than dragon-suited Page with a sunburst Les Paul. Truly iconic. Just my opinion, but hey, I'm not posting on a Van Halen site am I? Looking at those guitars makes me think Fender needs to invest in some better paint/finish for their guitars. DON'T FORGET PETER FRAMPTONS BLACK LES PAUL WITH THE 3 PICKUPS THAT WAS ON THE ALIVE COVER AND WAS LOST IN A PLANE CRASH. ALSO JIMMY PAGES BLACK BEAUTY WHICH WAS STOLEN. I immediately associate JP with those guitars too. I concur! Followed by Eddie's. I think that if you asked someone off the street, they would probably recognise these, especially Angus', his SG has become an icon of rock. To someone who doesn't know better, the Les Pauls would just all look the same! Jimmy's double-neck on the other hand is quite unique. 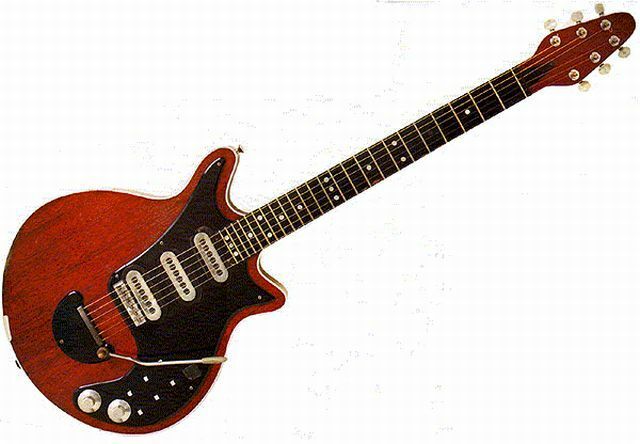 As is Brian May's Red Special. The next one isn't really iconic, just damn hilarious! Ladies and gentlemen...Rick Nielsen! And the SGs don't? Afterall, to someone "in the know", they only made Sunburst Les Paul's for 2 1/2 years. Just a handful. A few hundred. They made SGs for a decade (assuming we're talking vintage and not replicas). Certainly Eddie's Frankenstein would be the most recognizable. Jimmy and Angus' guitars kept a relatively stock apprearance. Same goes for Jimmy's doubleneck and Danelectro. In fact, the only guitars of Jimmy's to make you take a doubletake were his modded and painted Teles. 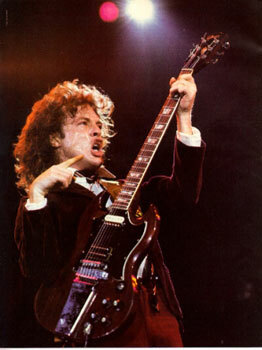 As for Angus' SG becoming an "icon of rock", I humbly submit two names (okay three). Eric Clapton, Tony Iommi and yes, Duane Allman. Oh and Gary Rossington for that matter. Guess it just depends on when (and where) you grew up. Please don't be angry with me for disagreeing with you Gibson Girl, I'm not out to shoot you down. Just adding to the discussion. Hell, how could I be at odds with someone with your screen name?